Angele Ellis, Mike Knapps, John Korn & Kelly Scarff will close out the spring season. The experimental, electro-acoustic microtonal improvised music group “Feeding Goats” brings its avant-garde sounds to Moscow 57, the new Russian Central Asian restaurant on Delancey Street on New York’s Lower East Side on Saturday, May 10th. The performance will start approximately 10:00pm. Other artists scheduled to appear include Jordan Pettay, Laura Foulke, and Ellen Kaye hosting and performing with the M57 Band. 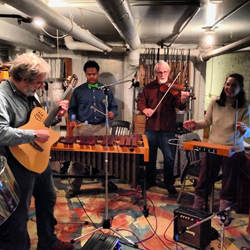 “Feeding Goats” features artist-musician Michael Hafftka on guitar, synthesizers and other instruments, Yonat Hafftka on theremin, garrahand, steel pans and harmonium; Richard Carr on violin and computer and Allen Bernard Branch playing marimba and percussions. Karen Lillis, Taylor Grieshober, Adam Matcho & Dylan Nice prose it up at Amazing Books. You’d be a fool not to hear their words, drink free beer & buy some Book Darts. Maybe a book too if you’re running low.